My daily routine used to be much simpler, from changing of diapers to preparing of meals, playing with her and putting her to bed. By around 16 months, I realise she is understanding our instructions better and getting more curious with her surroundings. That is when I started to plan more structured learning besides her free play. It’s hard work when it comes to teaching Nat. Having to think of activities that is suitable for her age, and the extra time needed for preparation of the activities. But the greatest challenge is not in the preparation of activities, but its in believing in Nat. But the greatest challenge is not in the preparation of activities, but its in believing in Nat. Nat will not always sit attentively when it’s time for her activities. There are certain activities where she will simply run away the moment she sees them. And certain mobility skills that I attempt to teach her seems impossible for her to master. There were many occasions where I doubted my ability to teach, and felt like dropping the idea and passing on this responsibility to a trained child care teacher instead. Having confidence that what we hope for will actually happen; it gives us assurance about things we cannot see. Faith gives us hope when we don’t see results in the present. And hope builds perseverance to carry on labouring, believing that what we hope for will eventually come to pass. More importantly, faith brings peace and not anxiety. Having peace in the aspect of raising and nurturing our kids is important. Having peace helps me to continually teach Nat with joy even though I don’t see results fast, It’s like play time for us, simply to bond with each other. Learning then becomes enjoyable and fun for both parties. But when I am pressured for results, I will pass on this stress to Nat and it will eventually kill her interest in learning. My wife used to say that kids are generally happy when they get to play, and a happy child learns the fastest in this road of learning. When they are happy, learning becomes fun for them. And they will eventually be self-motivated to learn in life. But when they are pressured, it kills their fun and they will stop wanting to learn. I’m reminded constantly not to look for immediate results but enjoy the process of learning with Nat. What I should be working towards is not just developing a child to be smart but someone who grows up to be healthy in all aspect – socially, intellectually and emotionally. And being happy is a healthy emotional sign. Dad: Not bad, how many runners were there? Dad: Then you are the last! 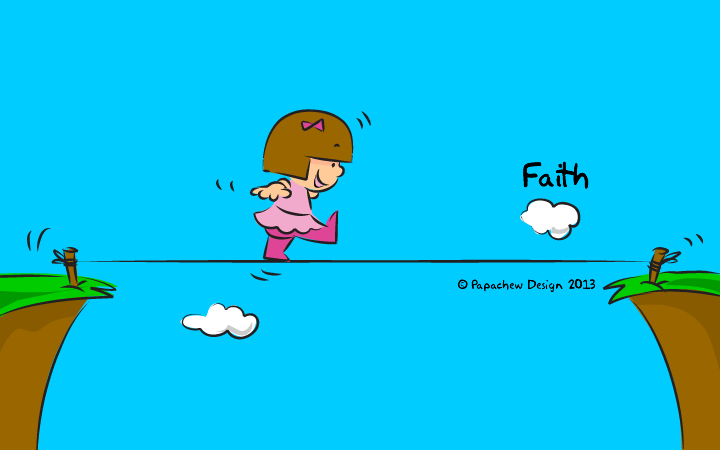 Faith helps us to have a positive outlook in life, an important ingredient in this business of parenting. It helps us to believe in our child when he seems not to be doing that well based on our standard. Being positive helps us believe the best in our child, in any situation that she is in. Not only does it benefit us as parents, it benefit our child a great deal too. Negativity will cause us to loose confidence in ourselves and more critically it causes the child to loose confidence in herself when she faces the real world. Below videos are milestone of Nat’s many first “victories”. At 6 months old ~ It seems forever to see Nat crawl. But she did! When we least expected it…In her own timing. At 15 months old ~ She never gave up trying to put on her seat belt. During one fateful afternoon, while playing with the buckle, we all heard a “click” sound. She did it! To my delight! At 16 months old ~ Found an activity that could engage her and help her grow in her mobility Skills. Do not despise small beginnings. But at the same time, remember that yesterday’s victory does not mean an end to tomorrow’s challenges. Most, if not all plants start with a tiny seed. And faith will always be needed even when we are having days of victory. Nat would not have progressed if she had given up after a few failed attempts. It is a good reminder of the importance of having faith, in Nat and more importantly, in myself. To carry on sowing and believing in the reaping that will eventually come. And when we reap, we have to sow again for the next season for such is the nature of faith. I’m glad I persevered and believed in Nat, for it’s a priceless moment when I can have the privilege of witnessing her many “first victories” in life. So keep sowing into our kids and don’t give up when the going gets tough, have faith in them and through their little victories, may we find faith in our own parenting journey. That’s what I found about teaching my older son too. Sometimes it seems that there is no progress at all and he does not seem to be paying attention or interested but SUDDENLY, one day, he will surprise us by demonstrating his grasp of the skill taught to us. So, yes, it’s true. We need to have faith in God’s timing and our child’s timing and abilities.